Growing up, Memorial Day always meant family reunion. Each year, we would travel back to Kansas to decorate the graves for our loved ones. We would also celebrate my 2nd great-grandmother Minnie (Hawks) Barber, her eight adult children, and - over the years - her hundreds of descendants. 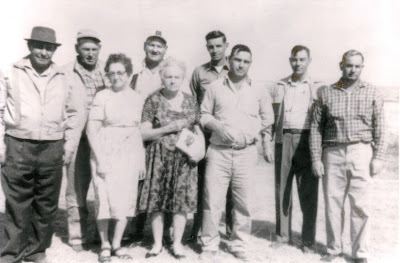 Minnie (Hawks) Barber pictured center with her eight adult children. Minnie Hawks married John Lumpkins in January 1897 in Rossville, Kansas. They had six children, of whom four lived to adulthood. On his 37th birthday, while walking home from work, John slipped on ice and sustained a fatal head injury. At 28, Minnie was a widow. In October 1914, Minnie married Joseph Barber. Together, they had four sons. Joseph raised Minnie's children from her first marriage as his own. Minnie lived out the rest of her life in the small prairie town of Plainville, Kansas. 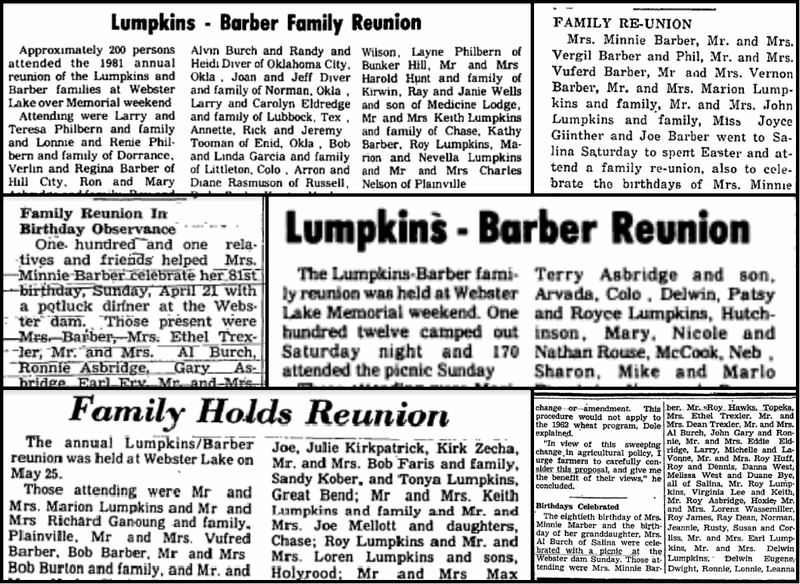 It was this family history that gave rise to the annual Lumpkins Barber family reunion at Webster State Park. Over the years, the reunion was routinely featured in Plainville's society pages. However, as the years passed and Minnie's own children began to pass away, the number of attendees started to dwindle. In recent years, the reunion nearly ceased. A few family members would meet at a local steakhouse and reminisce. But the days of hundreds of cousins reconnecting seemed a thing of the past. This year, I was eager to see if I could rekindle the reunion experience that seemed lost. In January, I reserved a site at Webster State Park. 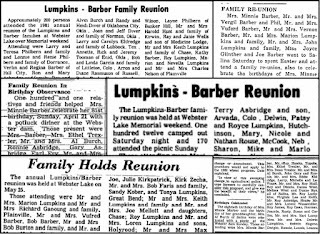 I next turned to social media, creating a Facebook event invitation that invited all of the family who were members of our online Lumpkins Barber Facebook group to a Memorial Day weekend potluck lunch. I sent regular reminders to make sure the reunion stayed on everyone's radar. 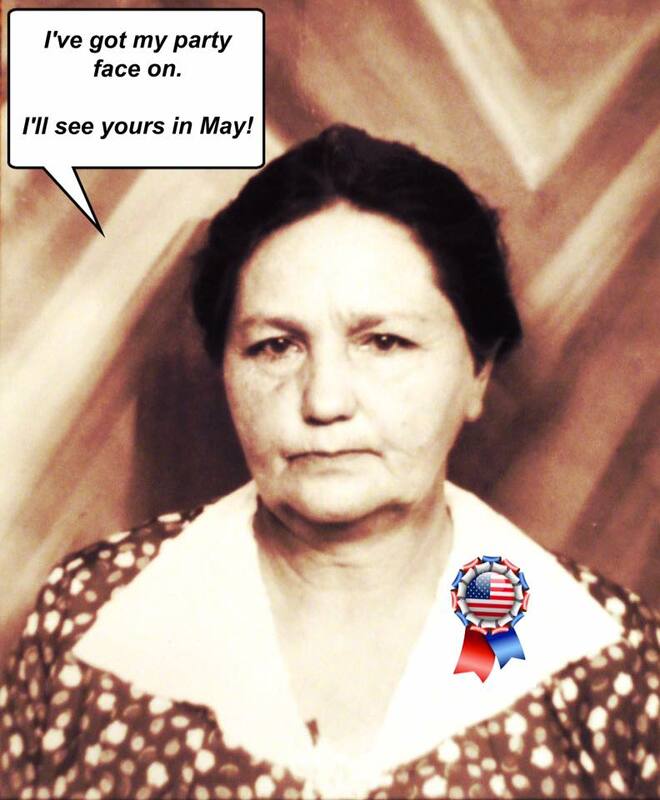 I even brought Grandma Barber into the mix, hoping she would be a compelling saleswoman for the reunion. Happily, the ancestors looked very favorably on our revived reunion. It was a huge success. The weather forecast calling for a 60% chance of rain gave way to warm sunshine. Attendance was remarkably robust with 100 people from across the US showing up to reconnect and remember. There was a fantastic energy and a strong interest in ensuring that the reunions continued. I think Grandma Barber would have been very proud to see her descendants gathering to remember her legacy - a legacy that seems positioned to continue for years ahead with renewed purpose and commitment. Congratulations on reviving the family reunions. Generations will thank you. Thanks, Mary! I appreciate that. It certainly felt like important work. Wow! It looks like a major success! 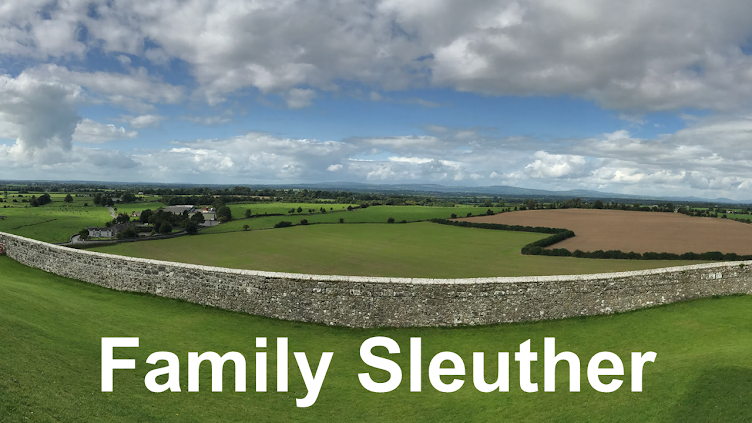 I've wondered if family reunions were a thing of the past as so many have dwindled. This makes me think maybe I ought to see what I can do to stir up ours. Good luck, Michelle. I'd love to hear how it goes and any best practices you pick up along the way. I've dreamt of doing the same! Very encouraging! It was a lot of fun, too! I hope you're able to give it a go and make it a reality. Good luck! Somehow I missed this when it was first published. I organized a 2 day reunion this Summer as well, that also boasted a 100+ attendance. They are a lot of work, but congrats on your successful one! I'm hoping to repeat another reunion in a couple of years-- but we'll see. That's fantastic! Congrats on your own success, Nicholas. I'm organizing another in 2017, so I'd be curious to hear any of your lessons learned or best practices. As you say, a lot of work, but well worth it.